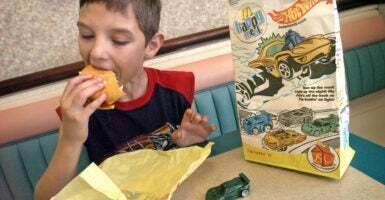 More than a dozen Michigan lawmakers support a resolution in the state’s House of Representatives pressuring fast-food chains like McDonald’s to eliminate “gender-classified” toys from their children’s meals. State Rep. Leslie Love, D-Detroit, who introduced House Resolution No. 49 on Wednesday, told The Daily Signal in a phone interview that the purpose of her resolution is to stop fast-food chains from reinforcing gender stereotypes. This is a significant issue as billions of these meals are sold every year and this practice can influence and limit children’s imaginations and interests by promoting some toys as only suitable for girls and others only for boys. @statereplove10 Hi, my name is Leslie Love. I just sponsored a bill about gender for toys at fast food restaurants because that is more important than better schools, infrastructure, city services and affordable housing. What a joke. So everything is running so well in Michigan they can waste time on fast food toys?? Michigan Lawmakers Want To Ban Fast Food Chains From Offering 'Gender-Specific' Toys. It doesn't matter if these people are going too far. We don't know how to stop it and more and more people are joining in out of fear of losing their jobs or social status. 1% of the population is now ruining McDonald's. For her part, Love said she has received positive feedback from her constituents on her Facebook page, and that this resolution hasn’t prevented her from being an effective lawmaker. “It’s not an either/or situation, it’s an and/with situation,” she told The Daily Signal. Love said she has already tackled many quality-of-life issues, such as pay equity, increasing minimum wage, and improving water quality. “If not, I would feel bad working on this resolution,” she said. Love also downplayed concerns about the intrusiveness of her legislation. She said the resolution was meant to give fast-food companies “an opportunity on their own to agree, take a look at their culture, and see how they can do better,” comparing her resolution to resolutions asking companies to put a greater emphasis on recycling. Love pointed to companies that have already recognized the need to shift away from gender classification. The resolution, which currently has 13 Democrat co-sponsors and one Republican co-sponsor, is not legally binding, and would merely constitute a suggestion for fast-food chains to change their current practices. It specifies that copies of its text should be sent to the CEOs of major fast-food chains in the state upon passage. Love indicated the resolution was assigned to the Commerce Committee, and does not yet know when a vote will take place. Additionally, Love said she was motivated by the circumstances surrounding this year’s midterm elections, which saw a record number of women elected to Congress.